If you live in Central Residential Area, missing your last meal after 9 p.m. on a Friday or Saturday night is game over. Worcester Dining Commons no longer serves late night, closing at 9 p.m. The neighboring Chicken & Co. shuts down after Thursday night. One of two Baby Berk food trucks might be around, but infrequent posting of their locations on Twitter make them unreliable. Student businesses like Greeno Sub Shop and Sylvan Snack Bar are understandably closed on the weekends. Berkshire Dining Commons and all other retail food areas that are open at these hours reside in Southwest Residential Area or the Commonwealth Honors College, a 15 to 20 minute walk away. “That’s alright,” I thought the first time this happened to me. “My roommate and I can split a pizza.” One problem: Everyone had the same idea as me. Food ordered on a Friday night can take two hours or more to arrive. Does the University of Massachusetts think people living outside of Southwest stop eating after 9 p.m.? Many students keep busy well into the evening for school- and job-related activities, not to mention that many students work late hours for the University itself. It is not unreasonable to think that students working these jobs, studying long hours or otherwise deciding to eat late should have access to the food they’ve paid for. 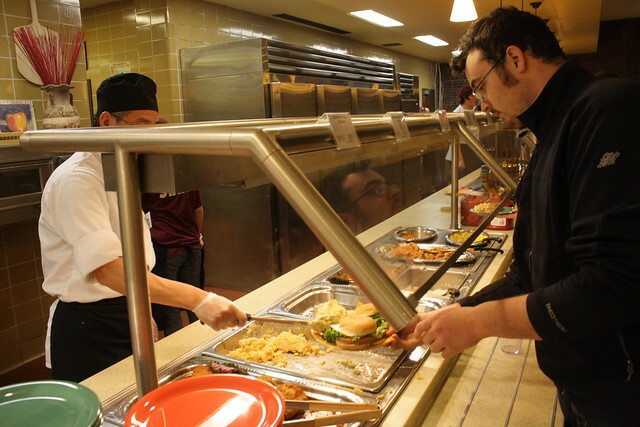 As I revisit the state of our dining halls, I must ask: Is this really unusual? Am I a hypocrite, falling into the same perfectionism of dining services that I once argued was contributing to the food insecurity on our campus? Is remaining open until midnight a lot to ask for? But I don’t think it is. When I talk about the accessibility of our dining services, some part of it is about maintaining expectations. UMass is a large university that serves thousands of students, so changes to hours dramatically affect the volume of students at the end of the night. Knowing what I can eat, having the flexibility to eat when I need to and seeing food available for me is what matters. Other campus dining programs that rank highly on the Princeton Review like Cornell University and Washington University have several dining options that operate until midnight or later, particularly on the weekends. Others, like James Madison University and Virginia Tech, serve more stringent hours, but that is because they operate on a breakfast, lunch and dinner model – plus, the meal plans are noticeably cheaper than ours. The argument that adding hours will add to the costs of dining is compelling. I’m not sold that this is the reason for the cut in hours, however. To reiterate, there is no single food establishment outside of the Southwest-Honors hub that is open on Friday or Saturday nights. I can only speculate on the demand, but the lack of supply is astonishing. I find it hard to believe that even reduced service is impossible. Luxurious late-night dining is hardly necessary. It doesn’t need to be called “Late Night” or be as complete as a normal evening, it just needs to spread out the evening crowds, give access to late-night visitors and make the dining service more accessible. According to an alarming study by the Wisconsin HOPE lab, 39 percent of Massachusetts public university students struggle to afford the meals they need. Well over a third of students work during the evening, and this number climbs into the 40 percent range for students who are housing or food secure, the HOPE survey found. This suggests that those food-insecure students who manage to acquire a limited meal plan suffer the most from inaccessible hours. Not a school year has passed since a group of protestors silently declared their dissatisfaction with the costs of UMass’ meal plan prices. It’s already unacceptable that our meal plans are astronomically expensive and contribute to an insecure food culture. It’s even more unacceptable that those of us who can pay – sometimes barely – can find themselves in a food desert on Princeton Review’s top campus dining location.